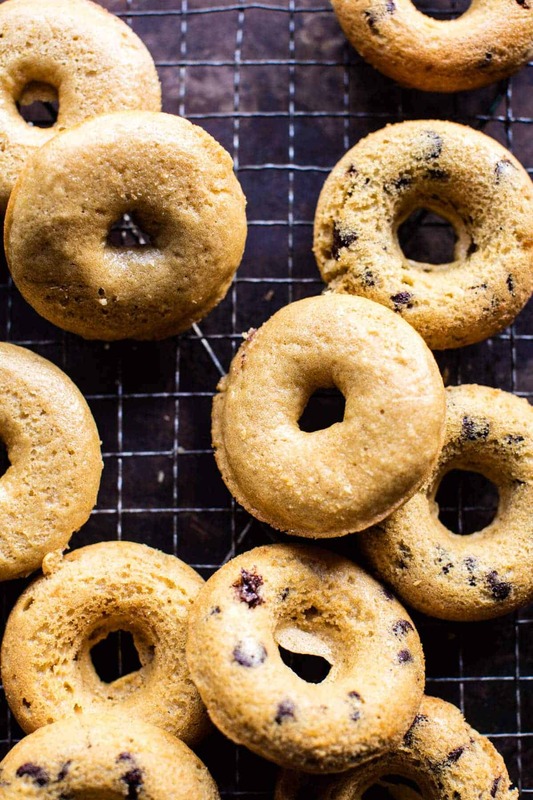 Because we’re making apple cider doughnuts…with chocolate chips…and salted caramel. Here’s the deal, I feel like sometimes a Tuesday just needs something like these doughnuts. I mean, I dunno about you guys, but Tuesday is no Friday, and some weeks it can be just as much of a struggle as Monday. You know? So why not make it a million times better with something sweet, delish and very fall inspired, right? So it’s finally been sinking into my brain that stopping to take a work pause once or twice a day has been really helpful, and kind of a breath of fresh air…literally. For example, things like taking a twenty-minute walk in the late afternoon sunshine, or baking fresh cookies once I’ve gotten the hardest task of the day accomplished, or pausing work for an hour to run Asher down to Target to look at Halloween decorations. Just quick, little things to take a break and make the day less of a hustle and all around more enjoyable. It’s taken a long time to learn, but work breaks are a good thing…I mean, don’t get me wrong, I’m still learning, but slowly I am realizing that the little pauses are very helpful. Has anyone else figured this out? I know it’s what all the experts say to do, but you know, I am pretty stubborn, and it’s taken me a while to give in. The point here is that if you’re having a bit of a tiring Tuesday, take an hour and bake up some apple cider doughnuts. Obviously, for a lot of you this may not be possible until you return home from work, but sometimes dessert just needs to come before dinner. It’s what my mom used to do, quite often actually, and well, she pretty much always has a smile on her face. Really, why do mom’s always know best? I kid you not, when my brothers and I were kids, most nights of the week dessert would be made before dinner had even been thought about. Now you guys know why I have such a chocolate tooth. Anyway, sometime sweets are needed before savory, and personally, I’m feeling like that’s the case today. You guys with me or not? 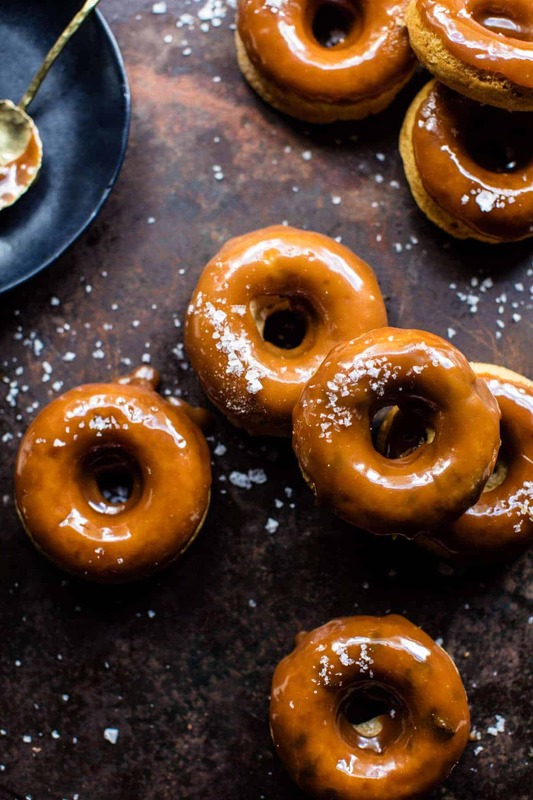 And really, these doughnuts are baked, not fried, so that kind of means they’re healthy, right? I’ve probably said this before, but I actually don’t feel like baked doughnuts are truly doughnuts. I sort of feel like if you’re going to call something a doughnut it should be fried. Baked doughnuts feel way more cupcake-like than doughnut-like to me… just my way of thinking I guess. 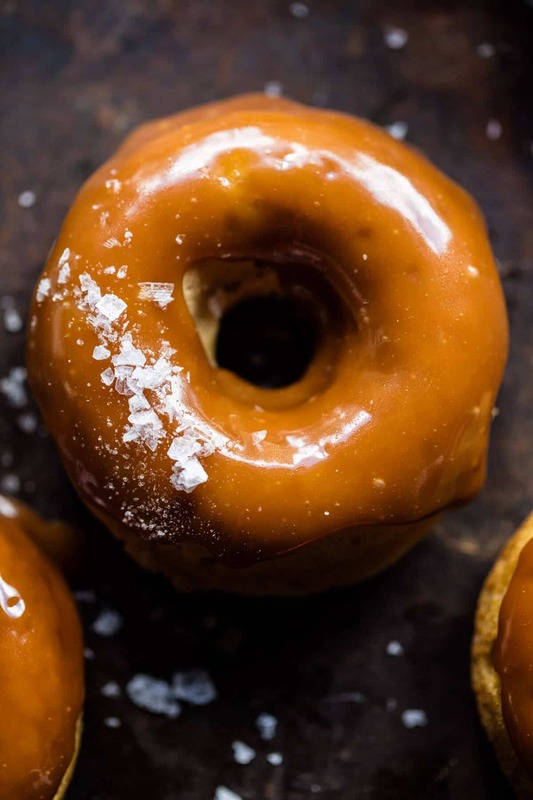 But whatever, because I love the cuteness of these baked salted caramel apple cider doughnuts, and there’s no denying that baked doughnuts are just easier. I have a love/hate relationship with fried food. I kind of despise frying things, I mean, I’ll certainly do it, but it is kind of a pain. So today we’re going with baked doughnuts, or as I like to call them cupcakes in the shape of doughnuts. No matter how they’re made though, these baked goodies are so flipping good, I mean, addictingly good. It’s all about that salted caramel. YUMM. And the doughnuts themselves? Incredibly moist, fluffy and super flavorful thanks to the apple cider in the batter. Okok, AND I maybe threw in a handful of chocolate chips too, because why the heck not? You can never go wrong by adding a little chocolate, as my mom likes to say. Oh and lastly, apparently I am really in a caramel mood. 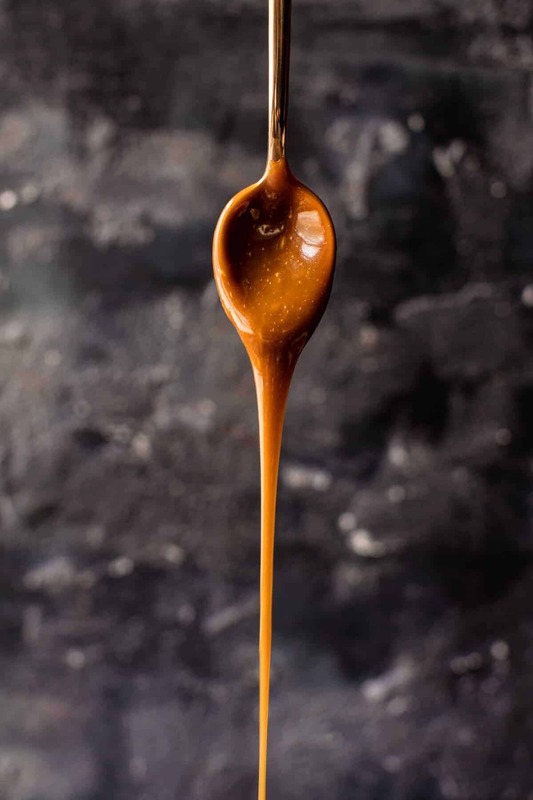 All of my sweet recipes coming up seem to involve caramel in some way or another. Guess it’s a Caramel Crazy Fall. 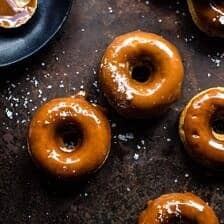 These doughnuts are incredibly moist, fluffy and super flavorful thanks to the apple cider in the batter. Preheat the oven to 350 degrees F. Spray a 6-cup doughnut pan with nonstick cooking spray or lightly grease with butter. In a large mixing bowl, combine the flour, baking powder, salt and cinnamon. In another medium mixing bowl, whisk together the eggs, brown sugar, canola oil, apple butter, apple cider and vanilla until smooth. Pour the wet ingredients into the dry and mix until the batter is smooth. Fold in the chocolate chips if using. Spoon the batter into the doughnut molds, filling to just below the top of each mold, 1/8 to 1/4-inch (3 to 6 mm) from the top. Bake for 20 to 26 minutes until lightly golden brown around the edges. The doughnuts are supposed to have a gooey center. Let cool in the pan for 5 minutes. 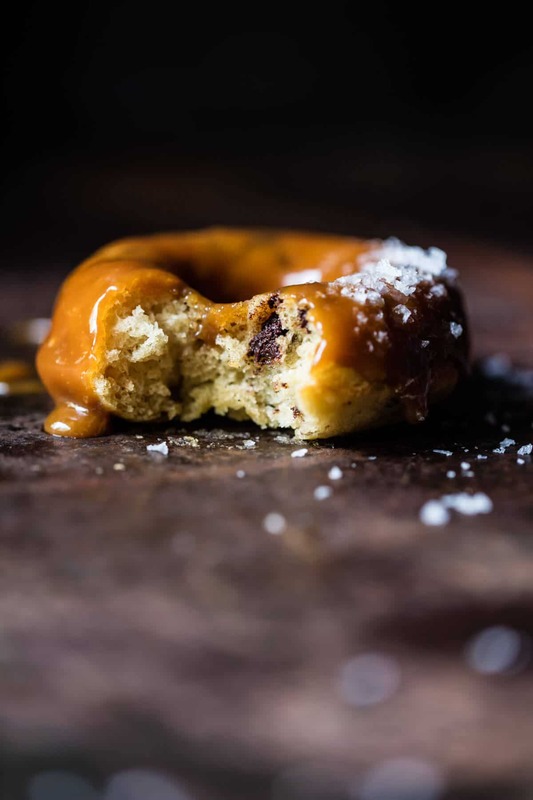 Slide a thin spatula around the edges of the doughnuts to help loosen them out. Then place on a cooling rack and allow to cool for 5 to 10 minutes before glazing. Repeat with the remaining batter. To make the caramel, add the apple cider to a medium sauce pot and bring to a boil, boil for about 15 to 20 minutes or until the cider has reduced to about 1/3 cup and is thick and syrupy. Reduce the heat and add the brown sugar, butter, and heavy cream. Bring back to a boil, reduce the heat and simmer for about 5 to 10 minutes or until the the caramel has thickened and is dark in color. Remove from the heat. Set aside to cool slightly. 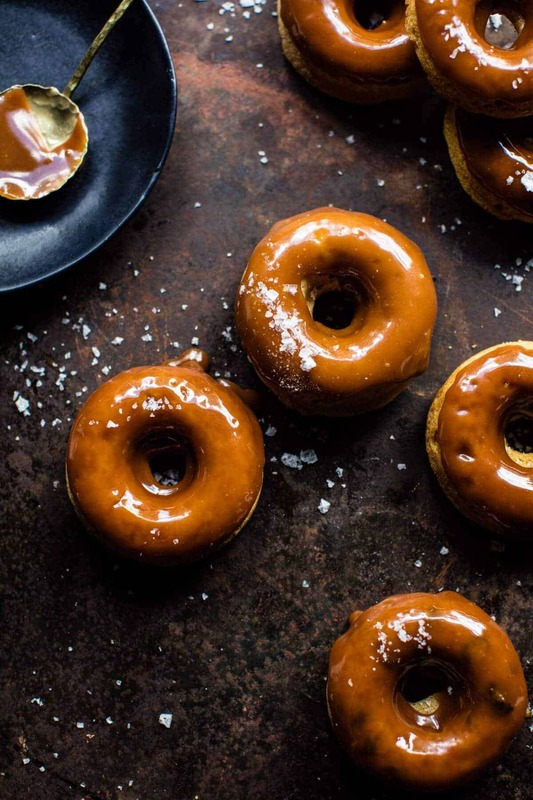 Dip or drizzle the doughnuts in the caramel. If the caramel thickens too much, just place over low heat and add a splash of cream to thin the caramel. *Inspired by Donna Hay Magazine April/May 2016 Issue. the color of that caramel ? i’m impressed that you somehow managed to get almost 3 cups of cider into this recipe! I am really craving these right now and they would be perfect for a second breakfast right about now. I am wondering though if you have a recipe for apple butter? I have no idea where to get it here, so maybe there is a way to make it at home? Hey Kat! I do not have an apple butter recipe, but here is a great one. Let me know if you have other questions. Thanks! Oh my gosh Sheila!! Thank you! Oh and of course I agree you do need a doughnut pan! It is so so fun!! These look delicious! ? My family loves apple cider, we just went apple picking over the weekend and picked up a couple of jugs of homemade cider ❤️ And the added chocolate chips to this recipe, just perfection! But your recipes are always pure perfection! I am so jealous of the apple picking! Sounds like so much fun!! Thanks so much Amanda!! Absolute NOMS!! These photos look amazing!! These look amazing!! Awesome recipe! Picking up more apple cider at the farm stand is on my to do list today since I used up the last of ours in your Apple Cider Chicken Marsala recipe last night which was totally decadent! That caramel sauce will likely be making its way into quite a few fall creations here. Oh boy I really wish I had a couple of these to go with my morning coffee! Love me some apple cider donuts, in any form. These look spectacular! I wish you did too!! Thanks Kathy!! Omg! I soo soo need this in my life right now! I do agree that baked doughnuts aren’t the same as the fried ones, definitely more cakey. But it’s still good with no worries of oil splashing. But that cider caramel! Yes, please! I made a promise to myself no donuts this school year–to many around here. Ah, a promise I couldn’t make! Thanks Nancy! Holy moly donuts! Oh my god! Donuts are literally the most perfect food. This is amazing! Haha! Yes were totally on the same boat!! Thanks Jessica!! 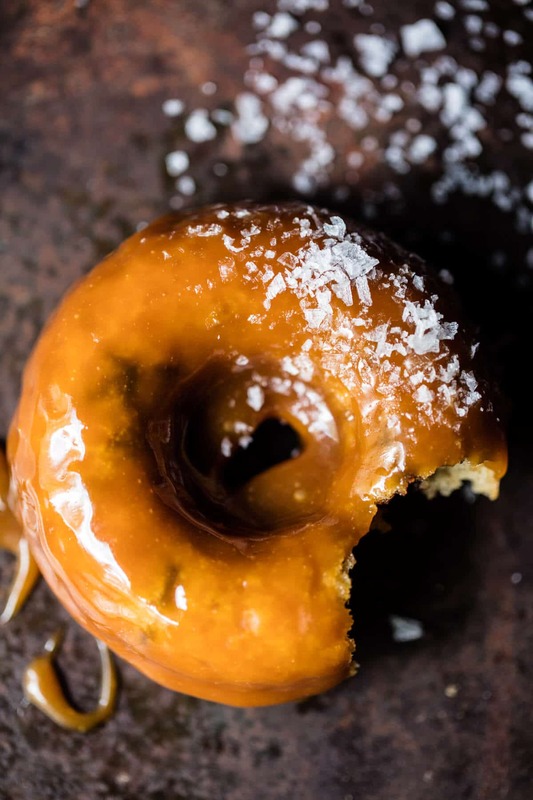 Is there anything better than salted caramel?! I don’t think so! That flaked salt looks amazing – I really do have to find some of that in my town. 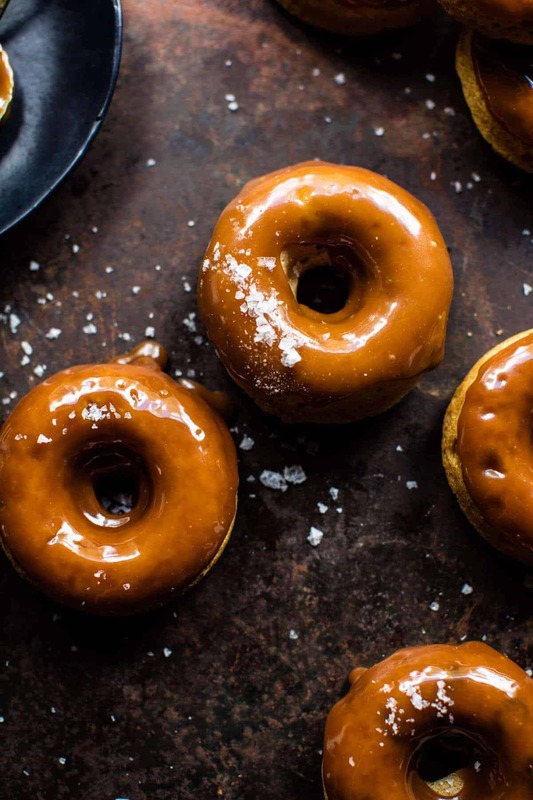 Have to ask: what donut baking pan do you use? I have been looking at all my local stores for one, but have come up empty-handed. Hey Kate!! I bought both my salt and doughnut pan on Amazon. Here are the links.. I am ALL for a caramel crazy fall! I love it! These are too cute! You and I both!! Thanks Chelsea!! These look great! Do you think the batter would work as muffins? Awesome!! Well I hope you try them and love them Maria!! do you think this would work with mini bundt cake pans? 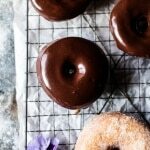 I don’t have a doughnut pan, but these look AWESOME! Hey stephanie! I do think that would work! I have not tried it so I can’t say for sure, but I think the cooking times will be similar as well. Let me know if you have questions. Thank you! ? Hi Tieghan, I live in Denver and I’m wondering where you find apple cider that you like. Sadly not many orchards in this part of the country. Thanks! Hey Jennifer!! So I just buy mine at City Market or Whole Foods. I like the whole foods brand a lot! Let me know if you have questions and thanks so much! ? These look amazing. Quick question? Will they last a day or two? I am thinking of making donuts the night before thanksgiving and then taking them along for the family to enjoy the next morning when we all get together. Hey! Yes, they will last overnight, just be sure to keep them covered to prevent them from drying out. 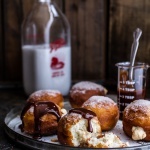 These doughnuts look incredible, I’m going to dream about that cider caramel! Haha thank you so much Laura!! 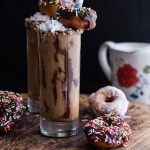 These actually looks so amazing – they’re making my mouth water! I think I definitely need to make these next weekend! I hope you love them Eliza! Thank you! I don’t have a donut pan could this be made into muffins instead? Hey Amanda! Yes! These work great as muffins, the batter should make around 12. Let me know if you have questions. Thanks! Made these yesterday, and they were DELICIOUS. The apple cider caramel is just brilliant. Thank you! I’ll be sharing this recipe (with a ton of shout outs to you, of course) on my blog tomorrow, because after people saw me making them on the ‘gram they were all pleading for it. Thanks! Woo!! So happy you loved it Jessica, thank you! Sigh, Tuesdays are also kind of my slump day! 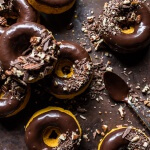 Definitely will be in need of some delicious treats like these donuts! So excited to try this recipe, it looks delicious. Can I substitute the apple butter with regular butter or should I use apple sauce? Hi Pika! I would use applesauce. I think that should be great. Hope you love the doughnuts! Hey! I know tis is kind off topic nevertheless I’d figured I’d ask.